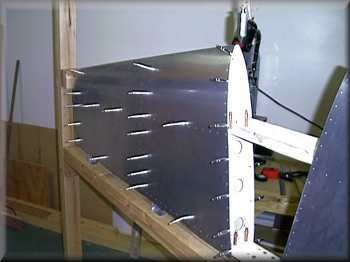 The jig you see below is required to build the various tail sections. It is built from plans. There is nothing special about it really. 4x4 vertical posts bolted to the floor and ceiling and a 4x4 horizontal cross piece to hold the tail pieces. Getting this plumb and level is no small task, particularly due to unevenness in the wood, floor and ceiling. Be sure to use clear fur, or other well dried wood product to minimize warpage. 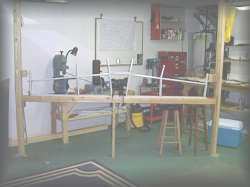 The piece spanning the jig in this picture is the horizontal stabilizer frame. Ready for skins to be slipped on, drilled, cleco'd, and riveted. Between the two vertical posts is a string holding a plumb bob used for alignment. BTW, 4x4's are not required, I used 2x4's screwed together to make a 4x4. The most difficult task here was getting the right distance between the vertical studs and getting them situated to bolt into studs in the ceiling, accounting for the garage door that needs to open. Here you see the skin on, clecoe'd, and the plumb bob hanging down for a perfect, no warp, setup.